ATLANTA, GA – April 9, 2019 – Clark Atlanta University (CAU) today announced that National Public Radio (NPR) Affiliate station, Jazz 91.9 WCLK commemorates its 45th anniversary this week. 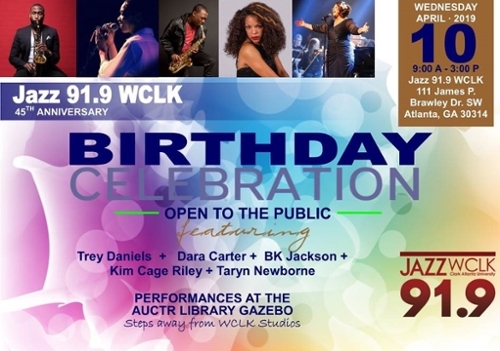 WCLK will host a birthday celebration at WCLK Studios featuring special performances by saxophonists Trey Daniels and BK Jackson along with vocalists Dara Carter, Kim Cage Riley and Taryn Newborne. The 45th Anniversary birthday celebration will take place on Wednesday, April 10 from 9:00 a.m. -- 3:00 p.m. at the Atlanta University Center Woodruff Library Gazebo, located steps away from Jazz 91.9 Studios. Clark Atlanta University serves as the licensee of National Public Radio affiliate station Jazz WCLK. Listeners and the greater Atlanta community are welcome to join the festivities, free and open to the public. On April 10, 1974, Jazz 91.9 WCLK aired its very first Jazz selection, “Maiden Voyage,” by Herbie Hancock. Under the direction of former Clark College President Vivian Henderson, and former Director of Mass Communications Charles Hobson, WCLK became the first black federally licensed educational FM station in Georgia. Transmitting from Clark College's McPheeters-Dennis Hall at a mere 54 watts from noon - midnight, WCLK marked the beginning of an exciting journey to cultivate an Atlanta public radio entity that would educate, inform and entertain listeners. For more information about Jazz WCLK, please contact Shed Jackson at shjackson@cau.edu or visit https://www.wclk.com/. Jazz 91.9 WCLK, a 501(c) 3 non profit radio station licensed to Clark Atlanta University, is committed to preserving the legacy of Jazz through dynamic Jazz musical selections, cultural programming and community-focused initiatives. Founded in 1974, Jazz 91.9 WCLK broadcasts a mix of Classic and Contemporary Jazz and Gospel music. WCLK is a nonprofit, member supported, National Public Radio (NPR) affiliate and Public Radio International (PRI) station that serves the interest of the citizens in Greater Atlanta. For more station information, programming details, and to listen on the Web, please visit: WCLK.com.